Looking up my ancestry trying to ascertain if I'm the great niece of Annie Oakley or Jesse James, I discovered a little more information about my Great Aunt Minnie. I was astounded to find out that her REAL name is Wilhelmina Rosella, one of my grandfather's twelve siblings. Can you imagine dealing with thirteen children in the 1880's?? My great great grandfather Daniel must have been rich beyond words!! This beautiful Pompador doll made in Germany in the 1850's is now 166 years old. Pretty hard to imagine, right? Curiously, her name is Wilhelmina Rosella. The bells in my head started dinging as I pulled out all the information I had, which happened to be hidden under her dress. My Great Aunt Minnie, who never married, lived in Colorado and was a personal nurse to an 83 year old patient. His younger sister owned the doll when their family moved from Germany to Denver in the 1800's. The Gottisbagen's lived in a huge mansion with six bedrooms, six bathrooms, a music hall, a library, a "salon" and a huge kitchen and pantry, inhabited by a chef and many servants. This is where my Great Aunt went to take care of him. She called the young housekeeper a "scamp", up to no good ... who never really cleaned the house! Upon his death, the place was closed up along with the doll. Some time later his sister, now a Luckenbach, required nursing care, so my Great Aunt took the job. 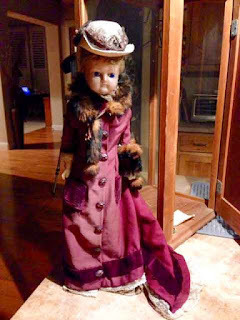 Luckily, the doll, along with many other possessions were finally delivered to Mrs. Luckenback after her brothers death. She had two children, described as unmanageable, who would inherit the doll and probably destroy it. Instead, she gave her to my Great Aunt for safe keeping. I assume my Great Aunt named her after herself and she's has been in the family ever since. In 1945 she came to my Grandmother and was then passed down to me. In a letter (kept under her dress) written by my Great Aunt in 1968 (just before she died) about where the doll came from, she states "I'm glad Nancy will receive her, but she better not ever sell the doll, because I will come back and HAUNT her!!" I totally believe that's true!! The head is made of paper mache with a wax covering and real hair ... the body thin cotton, filled with straw. She even has her own trunk with another beautiful red dress. She's a little worse for wear as pieces deteriorate from age, even though I keep her in the glass case. Today I'll go find her trunk and see how that's faring. I'll also check her lineage on Ancestry.com and see if I can locate any of her original family information. DARN!! No Annie Oakley or Jessie James so far. I wasn't supposed to complain any more, but sometimes you just run into people who should be knocked upside the head. Such was the case yesterday. As I've mentioned before, with the last update downloaded, my iPhone runs so much stuff behind the scenes that the battery won't even last five minutes before I have to charge it again. Sometimes the battery indicator is in the RED zone, yet when I plug it in, the indicator will say 50%. I went to my AT&T provider to discover my model has the battery built in (not replaceable) and I'm authorized for an upgrade. YAY!! It will cost me $800 for the phone and I will forever lose my unlimited EVERYTHING. BOOOOOO!! Back home, I called the Apple Store (an hours drive away) while I laid on the counter in order to keep it plugged in. Come to find out, the 64g phone will STILL cost me $800. There is a less expensive 16g, which I currently have with practically zero storage left and a 32g (perfect) but they discontinued it so you would buy the more expensive 64g. DANIEL took my order and my credit card number. Before we hung up, I was getting calls from my bank. When I asked for an appointment, he transferred me to Apple Care. That was his SECOND mistake. Nice as they were, after 20 minutes I found out Apple Care doesn't make appointments. Now being bothered by MORE phone calls from numbers I didn't know, I hung up on Apple Care to see what was going on. The first call was from my bank's Fraud Department. WHAT?? Yes I did make that purchase ... I wonder why they are calling? The second call was from Apple somewhere in Texas ... that's not suspicious, right?? I wasn't giving him ANY information!! He asked if I made that purchase, giving me all the specifics. Why yes, I did. Why is everyone calling me?? DANIEL had put my mailing address down as Allen Street, Memphis Tennessee. Now where in the world did he come up with THAT information?? No wonder I was getting phone calls. My ears perked up immediately, with FRAUD ATTACK ringing in them. Back on the phone (now 2 hours later, most of which was spent on hold), still no one could change the incorrect address, but Deshawn confirmed that the phone was at the appointed store and I could pick it up today. Needless to say, they are going to get an earful that I hope gets relayed to DANIEL!! There's no excuse for that kind of mistake ... what if he sent my phone to Tennessee?? Yes, this is all ridiculously expensive and time consuming, but when you have an unlimited everything account with a 17% government discount and a bill of $60 a month, you fight to the death to keep it intact!!! It's my portable computer that lives in my back pocket and I'm too old to change my ways!! 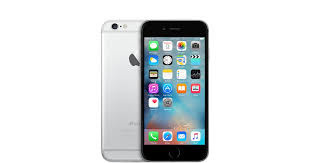 I figure $16 a month, assuming the phone lasts four years like the last one, plus $60 is still a deal!!! Now if I can get them to transfer everything over to the new phone, I'll be a happy camper, assuming it's actually THERE!! Wish me luck!! Bark, Bark, Bark ....... Bark!!! So I guess you know Cooper got his voice back. I love him to death, but around the house, he barks a LOT!! It's either someone driving by, or the kids playing next door .... the roosters .... another barking dog or the imaginary cat that haunts the back yard. On one hand that's a good thing since I doubt anyone could break in without him giving me warning. On the other, it can be annoying .... VERY annoying ... at least until I've had my coffee!! 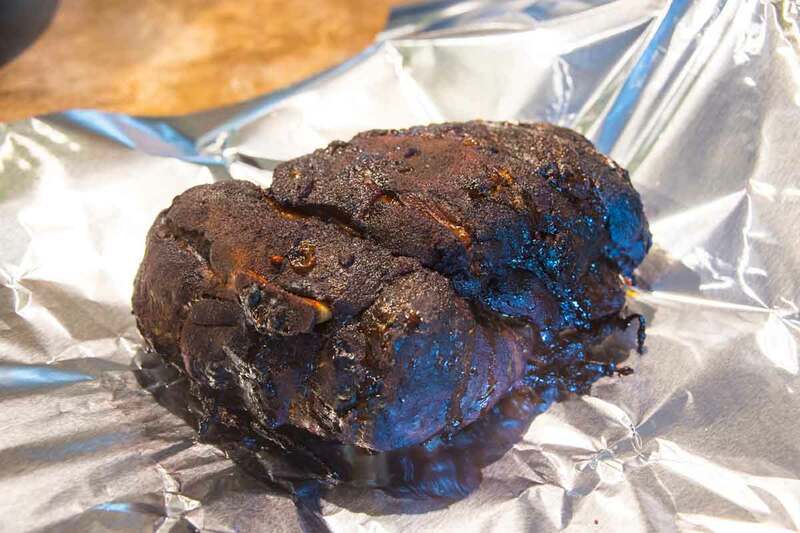 I forgot to mention the pork shoulder I cooked for Easter. It came out of the smoker looking yummy before I wrapped it up and placed it in a cooler to rest for the next two hours. Too bad it didn't turn out as good as it looked. Yeah, my first smoker mistake. I only cooked it for 12 hours ... it needed at least 15, even though the thermometer read 185. Half of it was done to perfection, easily pulling apart from the bone. The other half was done, but did not allow pulling. A disappoint to be sure, but not enough to require a burial. Instead, I sliced it up very thin for sandwiches, donating all of that and half the good part to my friends in Atwater for helping me move the china cabinet in my sewing room. 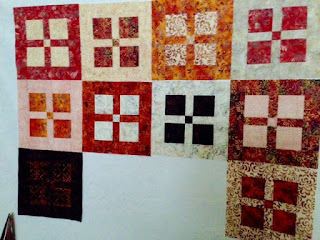 Here and there I've been working on two different quilts. Not the best thing to do because it's very easy to make a mistake in the cutting dimensions. I know this from experience! I had to buy two more fat quarters!! 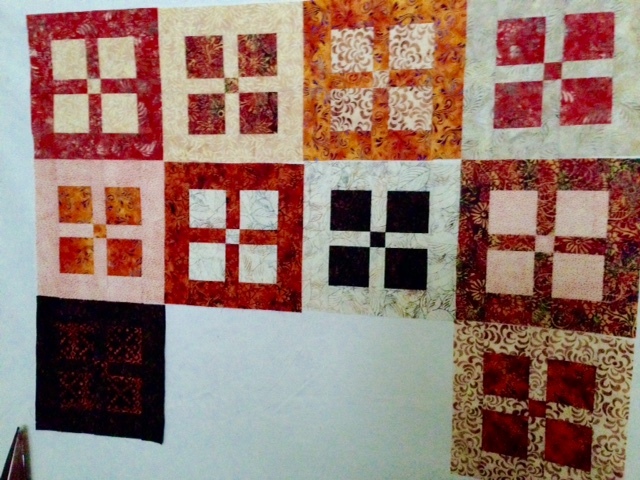 Once I have all the blocks sewn for both quilts, I'll stop and reorganize the mess that is the sewing room. With no place to put everything that came OUT of the cabinet, it all went on the floor. Unfortunately, that put it into the realm of Cooperdom. He sticks the ball on top of the pile, then drags material over the top, with the resulting cascade of material hiding it for him. Then he roots around until he finds it and goes at it again. The good thing is he keeps himself busy so I don't have to throw the ball. The resulting mess of course is up to me to fix!! Just like a three year old!! Yesterday, I spent some time on Ancestry.com. Lucky for me, my friend Nick Russell renowned author (yes you are Nick ... you KNOW you are!) and Editor of the Gypsy Journal, did a little search and sent the results to me. It was enough to get me hooked. True, not all the information is correct. Some had half correct information, some had misspelled names, but the majority of names are familiar. For example, I didn't know my Grandmother had three brothers and one sister, but the names were familiar ones I had heard her talk about. I now have names and birthdates ... Great Grandmother Nina (or Nora) Allen married G. A. Perkins from Tennessee and they had five children ... and here's a scandal ... my Grandmother married at the age of 16!!! I remember her saying that, but I really didn't believe it!! So today I will sign up for Ancestry.com, even if only for the two week trial, to see what other scandals I can find. Fascinating stuff ..... maybe I'm related to the Jesse James!! It's weird how things happen sometimes. Yesterday I wanted to post a picture of me in my brand new Easter dress when I was about four years old. While flipping through my old albums, I found this one. I have a larger version that I restored for a photography class, but I don't ever remember seeing this exact picture. Apparently at some point I had it in my hands, since all the writing on the back is mine! There in big bold print is every single name. Originally, I thought the baby was my grandmother. How wrong I was. 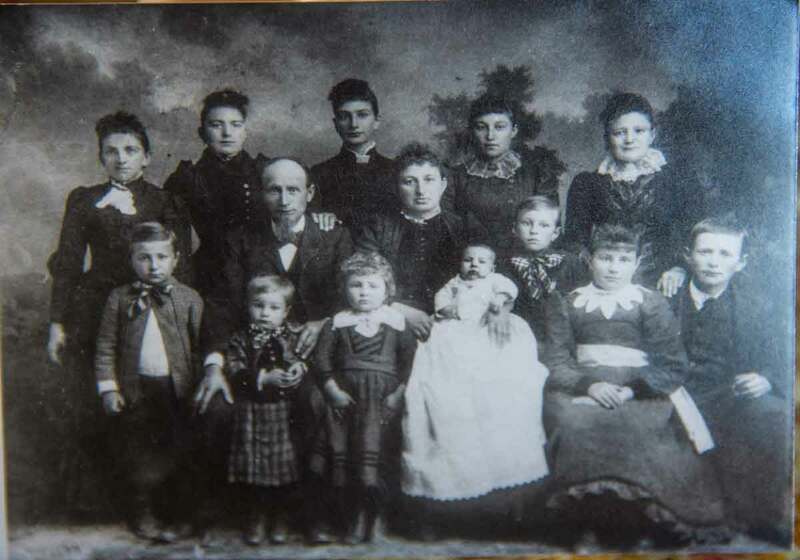 The little boy second from the left, front row, is my Grandfather Alvin, later married to my Grandmother Grace Perkins. What a shock!! Although we have information on my Dad's side of the family clear back to the 1600's, I knew little about my mother's side until now. This is some exciting stuff for me!! Some of my information was correct ... the back five girls belong to Daniel from a previous marriage. His current wife Catherine Christine spit out seven MORE children, including my Grandfather Alvin. YIKES!! On his left is Minnie ... I remember visiting Great Aunt Minnie in Denver Colorado before she passed away. The baby is the mother of cousin Penny, the only redhead in the bunch, who also lived in Denver at that time. They were apparently pretty well off, as everyone seems to be dressed well for the 1880's when this photo was taken, and can you believe it? They are all looking at the camera!! I knew my Grandfather Alvin as the big giant of a man who liked to fish. All of the pictures I have of him show a nice creel, a big pole and lots of fish on a string. He died when I was about four years old. Alvin worked on a construction crew to build the road over Walker Pass east of Kernville California. I was told way back when, that my grandmother Grace met him while working as a cook in a big crew tent. They married at age 17 I think. The only other information I have on my grandmother is this: Mrs. Caroline E. Allen, my great great grandmother, had a daughter (my great grandmother - no name) who married a "damn" Yankee named Perkins and moved to the city of Clay Center, Kansas, where my grandmother was born. All of them were disinherited from the family, which probably means the Allens were slave owners. Since I'm such a history buff, all this stuff is fascinating to me, so I'm on the hunt for more information. After all, if it weren't for family, I wouldn't be here!! I hope everyone has a wonderful day gathering Easter Eggs with their grandkids. Did you know that decorated eggs have been found to be over 60,000 years old? Later on, during a spring ritual of rebirth in Egypt and Mesopotamia, the eggs were dyed red to represent the blood of Christ. Of course there is lots of speculation and many different sides of the story. In our house, the eggs were always colored the night before and kept on the table (??). They were hidden by my grandfather around our ranch house while we went to church. Always in our Sunday best, my dress being handmade by my mother, we searched until we found them all. I vaguely remember some weird colored deviled eggs. There was no such thing as PLASTIC eggs filled with candy or money, although there WAS a chocolate bunny for me. What I DO remember is finding a couple of eggs days later and crying because I couldn't eat them. From that time on, someone always kept count of the number put out and collected!! There was no egg coloring here, but I did want to try one of my mom's old Easter specialities, Egg Nog Torte. Did I mention she was the original Chef who cooked on live television? Too bad some of that didn't rub off on me. In the early 1950's, once a month, we would travel to the big city of Modesto, where she would prepare meals live on TV for the Cattleman's Association Eat Beef campaign. I was in heaven, because MY favorite show was Looney Toons, with Biffo the Clown, shown right before the cooking show. Does anyone remember the spinning spiral you looked in to so the cartoon would play? If you were a good little girl and sat quiet, you MIGHT be picked to win the prize of the day ..... wait for it ....... a BIFFO BALL!! You know, the one attached to the string that broke the first time you played with it? I think I mentioned all this before. Anyway, I tried making the meringue first. What a disaster THAT was!! I searched through all my old cookbooks from 1947, 1950, 1963 and 1979, to no avail. I couldn't find her recipe, so I pulled one off the internet. I guess I didn't beat the egg whites enough, although it looked real pretty when it went in the oven. This is a slow cooker ..... 1-1/2 hours. Turn the oven off and leave it for another hour. Once out of the oven, I noticed it weeping around the edges. THAT is a no-no I definitely remember. The entire thing should have been hard on the outside, not soft and gooey. I said a nice blessing over it as I filled in the hole in the back yard. Onward and upward ..... I've had this pork shoulder in the freezer, so I figured it was time for some smoking. It's all seasoned, waiting for the 9:00 pm hour so I could start the smoker on it's twelve hour mission. For some reason I couldn't quite get the briquette device going, but after several attempts, they began to move. I forgot all about putting the pan of water in the bottom to catch the burned ones. Luckily, I remembered just in time, but couldn't find the pan. I vaguely remembered throwing something away that looked like an old dog food dish. UH OH!!! That was IT!!!! I frantically ran around the house trying to find a metal alternative. A large bird feeding bowl might work .... it HAD to work, since there wasn't anything else to use. I filled it with water and threw it in the smoker just in time to catch the first burned up wood biscuit. With everything set, I went to bed. So far nothing bad has happened. I got up just in time to reset the nine hour clock for another three hours. The dead biscuit bowl was out of water and overflowing with black pieces of wood. I definitely have to order another pan today!! In two more hours I should have a beautiful piece of pork that I can pull apart for my Easter dinner. There won't be any colored eggs, since they all went into the meringue, but I'm stealing a couple I boiled up for the dogs and making deviled eggs. An Easter Feast in the making!!! By the way, Cooper is almost back to normal. It has been a blissful two days since he barked, I'm guessing because of a sore throat. He and Jessie are definitely looking forward to Easter dinner!! It's been said that a good veterinarian is worth their weight in gold. I'm here to tell you that is true!! Yesterday, I filled up the pockets of my Vet to the brim. At the very least, I paid his electric bill for the next three months!! I really can't complain, because this little guy is like my kid. You'd do almost anything for your kids, right?? Cooper has a tendency towards bad teeth, so when it came time to have them cleaned, I went to the best Vet I'm acquainted with, which meant $$$$$$$$. The initial estimate was a gut wrenching $560. Unlike some vets who offer a low price, then add on things you might like to pay EXTRA for, like anesthesia and pain pills, this vet gives it all to you right up front. I dropped him off at 8:30 am, then ran home and tried to stay occupied so I wouldn't worry. I have friends whose pets never returned, so I was a nervous Nelly. At 10:30 the phone range. OH NO!!! My worst fears did NOT come true, as they only needed approval for another $50 to remove two bad teeth. By the way she said, his vaccinations are past due. Okay .... add that on, and while you're at it, can I get a prescription for a different heart worm medication? I quit giving him the old one because it made him sick every time. No problem, right?? Finally a call that everything was fine and he was waking up nicely. WHEW!!! I was so relieved, all I could do was sit on the couch for the next five hours watching the clock. I finally raced out the door and drove to town. Ten minutes later I was in shock when they gave me the bill. I asked for some oxygen, but that would cost me more, so I just bit the bullet and tossed my credit card on the counter. $760 dollars later, enough for a CROWN in MY mouth, I carried my sleepy baby to the truck and we drove home. Isn't that the craziest thing you ever heard?? MY teeth cleaning is $95.00!!! Turns out the "other" heart worm meds cost $98 for six months, plus the test of course ....... of course!! Not to mention the shots. We weren't even in the door at home and Cooper was going crazy looking for his ball. Although I rolled it around for him a couple of times, he really didn't feel good. I finally got him to sleep in my lap on the couch. He's alive and well, so I'm a happy camper, even though I'll have to scrimp a little to pay the bill. He's worth HIS weight in gold too, so what's a MOM to do!! What about Miss Jessie you ask? Well she ripped a big hole in her skin running through the rose bushes on the day I was taking my horses to a different Vet. They had to put her out to stitch it up, so I asked them to clean her teeth at the same time. $300 for the whole shebang!! That Vet's pockets are lined with gold from the horses they treat!!! I always wanted to be a Vet when I was a high school kid, but they wouldn't let females in the program. I wasn't even allowed to take Ag classes at my local Junior college. Maybe then I could have cleaned his teeth myself and MY pockets would be full of gold!!! Hmmmm, but then I'd have to pay taxes!!! I know, I shouldn't complain about paying all that taxes, but I've worked hard all my life and saved all I could for retirement. To reward me for my diligence, I'm taxed like crazy. It happens that I live in a huge Welfare hole in the middle of California, where every day I see people getting free money for everything ... for college (I had to work for my schooling), free money for food and rent (they buy steak while I eat pasta), and to make it worse, they DEMAND it! On the other hand, because I've worked hard, I get to live a pretty nice life in a beautiful house and drive a big RV around the country, so I'm done complaining. I also get to eat STEAK .... finally!! I threw this huge ugly steak on my new grill last night. It came out WONDERFUL!! You were all right, this Weber Q1000 is a keeper!! Having cleaned out the basement of the motorhome, I now have the perfect spot to carry it with me!! Early this morning, Mr. Cooper has to go have his teeth cleaned. I'm terribly nervous about this whole thing. He's like my kid, you know? To make it worse, I can't stay there. It's a drop off and pick him up around 3:00. You KNOW I'm going to go crazy all afternoon waiting!! Put in a good word upstairs for me, if you would please!! In the meantime, I'm eating STEAK and eggs for breakfast!!! I tried to steel myself for my meeting with the accountant by finishing off the last of my corned beef hash with egg. It was wonderful while I was eating it, but immediately after came that feeling of dread!! It was a sixty minute drive to Stockton over the worst section of California freeway EVER, not helping my mood in the least. They have been working on replacing a two mile section here for well over five years .... and it's STILL not done. Lucky for me, traffic wasn't TOO bad and I actually remembered where his office was. I tried to double check on my phone, but the battery was again dead as a doornail. This battery problem came from the last update I installed, which I'm sure was meant to disable the phone so I would buy a new one. Can you tell what kind of mood I was in?? At any rate, we went over all the paperwork and crunched the numbers. 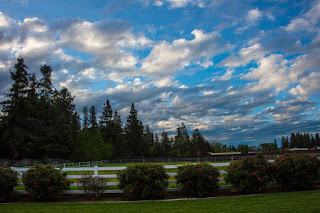 Over the years that I lived on that ranch property, we had to pay a ridiculous amount of taxes, including inheritance taxes upon the death of my grandfather. That and the bad cattle market, threw us into bankruptcy, although there was no such thing back then. I guess the only thing we are assured of is death and taxes!! When inherited from my parents, it was the same nonsense .... taxes up to wahzoo!!! In all the years I owned it, I've never made a dime. Every cent I made went into repairs until my brother (yes I have a brother of sorts) insisted I move out and the place be sold. My attorney said I had no choice in the matter. Since I couldn't afford to buy him out, I had to put off my retirement for several years and find the home I live in now, but the ranch never sold. 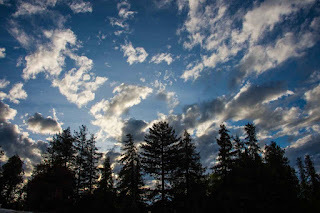 With renters in place, I wasn't able to collect enough rent to repair the roof ($18,000) or the rotten window sills from over watering ($7,000), not to mention repairs on the septic system and well. It was a BIG drain on my bank account. Now the government is taking a huge chunk of the money I made from the sale. On April 15, I will owe $57,000 in taxes, about a third of what I made. And by the way, that income will increase my medicare and supplemental insurance so high that my social security check will be cut in half. The plan was to pay off my current home, but that isn't going to happen. On the way home, God decided to incite me even more by throwing up a 20 mile traffic jam where I drove 25 mph or less for well over an hour. I just turned my radio up full blast and tried to ignore everything going on around me!! In an effort to keep myself occupied, I spent the next hour at home making another wonderful Miss Terry pizza, which came out much better this time. Eating pizza at 8:00 at night isn't exactly the best thing to do, but there's nothing like a pepperoni stomach ache to keep your mind off your problems. Today I'm trying to wrangle up some help to move my heavy sewing room cabinet to another wall. I'm pretty self sufficient, but this move requires help. Maybe I can bribe them with a little pizza and beer!! 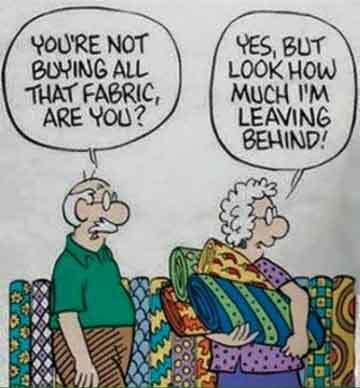 I'll have to check the couch for change!! Grumpy, Happy, Sneezy and Sleepy!! I'm running the gamut of seven dwarfs this morning as I try to recover from a night in the Magic Kingdom of Elks Bingo. Yesterday started off nice enough with the dogs not jumping on me until 6:00 am. That was a fairy-godmother moment as I got in another thirty minutes of frightening nightmares, making me Miss Grumpy right off the bat!! About that time I remembered my leftover corned beef hash, putting a big smile on my face. Reheated with an over-easy egg on top and I was in heaven. There's nothing like a WONDERFUL breakfast to get a great day started!! Full of energy, I spent about three hours unloading the belly of the beast and reorganizing the contents so my new barbecue would fit in the motorhome. Out with the tables and remnants of the FMCA rally in Indio and in with ...... nothing!! You can actually see all the way through to the other side! That made me very HAPPY!! I even gave myself a high five when the BBQ actually LIT and flames began to heat up the grill. It didn't take long however, to remember I needed to jump in my Chevy chariot and head on down to the Magic Kingdom. I'm not sure what's in the air ... mold probably ... but that's when the sneezing fits began. Or maybe it was all the stuff I sprayed on my cloth seats to remove the stale air from my truck ... something like my house!! Sneezy continued for over an hour! The night began rather slowly at 4:00, ending in a crush of peasants trying to get their Bingo cards before the games began at 6:30. We slogged right through trying not to become Grumpy again. Prince Charming received a large plaque for being .... well ..... Prince Charming, which caused lots of clapping and HAPPY players. The rest of the night we sat at our table, told jokes and generally had a GREAT time!! The infernal machine, better known as the black box, worked it's magic and ended up two dollars short. That's nothing short of a miracle, at which time we all had another round of celebration!! By now, I'm in Sleepy city. It's WAY past my bedtime and I can't stop yawning. I made it home just in time to be wide awake for the next hour so I could think about how bad I felt. Between the hot dog and the brownie, I wasn't faring well. In spite of all the stomach soothers I took, it's not much better this morning. So Grumpy is going to turn into Sleepy so I can be Happy when I drive two hours to my Tax Accountant appointment this afternoon, at which time I have no doubt I'll be extra GRUMPY!!! There's nothing like writing a big check to the King of the land so he can give it to all the peasants for doing absolutely nothing!!! Signing off now ...... Grumpy ... but Happy because I have leftover corned beef hash!! They lie .... that's all there is to it!! If you remember, I purchased this little Weber barbecue awhile back and never could get it to work. It wasn't the one everyone recommended (my first mistake) but it was small and compact. Unfortunately, it required assembly. I'm sure I followed the instructions to the letter, but I never could get it to light. Plus, in the "old" days, it came with a nice lightweight grill that was easy to clean. THIS one had a huge heavy piece of metal for a rack. So I returned the one above and purchased the Q1000 that everyone recommended. It's lightweight and there's NO assembly required. At least that's what the advertisement said. I struggled to get it from the UPS office to my truck. It came in a huge box and was VERY heavy. As I pulled it out of the box .... wow .... it's so light!! I LOVE it!! After setting it on the table, I opened the top, which promptly fell off on the floor!!! Good thing I was wearing my cowboy boots!! Why in the world didn't they attached the lid? It was then that I saw the huge bag of parts and pieces!! As it turned out, I only needed to install the lid and handle and fix the big ding in my floor. YAY!! I'm ready to go!! Except when I opened the lid the second time, it dawned on me there was no grate. What??? I scrounged through the box to find the two-piece VERY HEAVY grate in the bottom. So heavy, I had to use two hands to get it OUT of the box. So much for my lightweight grill! Now to test it with some ugly steaks and find a place in the motorhome where I can store it! Good luck with that, right? Having had some success, I decided to whip up some corned beef hash for dinner. Now here's something I've never made before. It can't be too hard, right? Onions, potatoes and corned beef chopped up and fried. I got out my cast iron skillet and went to work. So far, so good, but it wasn't browning like I wanted, so I turned up the heat (I'm pretty sure I just saw you cringe!!). Next thing I know I hear POP POP ... and corned beef is flying in the air all over the kitchen!! When that little bit of fat gets too hot, it explodes in a shower of little bits like fireworks. I lowered the heat a little and tried to be patient, letting it get crispy brown. BOY WAS IT GOOD!! In spite of the mess of cleanup, this was the best corned beef hash EVER!!! I can't believe I cooked something so delicious!! I can tell you right now, all the leftover beef I put in the freezer will become hash!! Two successes in one day ... you can't beat that, so taking no chances, I sat on the couch for the rest of the night!! Tonight is Magic Kingdom night and tomorrow I have a 90 minute drive to my accountant for tax preparation. Somewhere along the line I want to try a couple of steaks on the grill. For now however, I'm having corned beef hash for breakfast!! 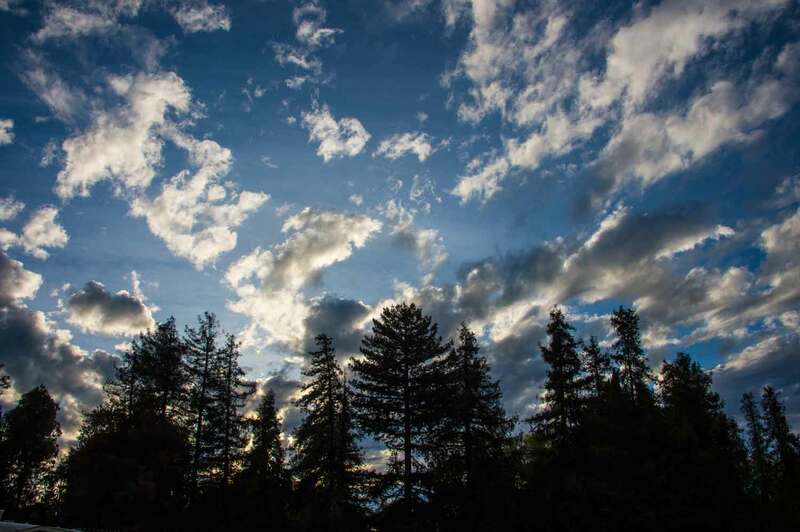 Clouds have been hanging out in California the last couple of days, making it a little cooler. Highs in the 70's with lows in the 50's make for pretty nice days. It won't last however. Every year we get a false spring in March, then WHAM!!! April gets cold, wet and nasty! Although I waited for a beautiful sunset to photograph, it never happened. The clouds were too thick and blocked out the sun completely. I spent the better part of yesterday going through my stash of cookbooks, some of which are on this bookcase. Cooking used to be a big thing when I was a kid. It was pretty much all the women did, besides laundry. I have most of my grandmothers books, along with many from my mom, none of which help me in that endeavor. I do like to try however, so I've accumulated many books over the years. Honestly, I could sit down and read a cookbook from cover to cover, just like any of Nick Russell's Big Lake Mystery Series, which by the way, if you haven't read, you should log on to Amazon.com/kindlebooks and purchase one. They are entertaining whodunnit's that will keep you on the edge of your seat. Yes, that is a Nu-Wave oven sitting there. Have you ever tried to clean those things??? It's become a bookend. Anyway, I weeded out several books I probably won't use, like 101 Casseroles, Wok Cooking (since I don't have a wok) and The Biggest Book of Canned Soup Recipes (it sounded good when I bought it). Mostly in the "old days" they only had Betty Crocker to help out, along with a green card box full of recipes from the neighbors ... things like Geologists Delight and Chipped Beef. I turned my green box into a photo album of oldies but goodies. Unfortunately, most involve something that isn't on the grocery shelves any more, or requires some long two hour process. I have come to a realization however .... it's not about getting dinner ready in a hurry ... a 30 minute wonder if you will. It's about the process ... the fun of making that pizza dough three days before, the sauce two days before, then taking 90 minutes to put it all together with another 15 to bake it. I should be enjoying the PROCESS as much as the five minutes it takes me to eat the results and put everything away. Maybe if I wasn't always in a hurry to eat, I wouldn't have to dig so many holes in the back yard. I'm going to give it a shot! Although it's supposed to rain today, I'm off to pick up Jonathan food and a couple of fat quarters to finish my square block quilt. Then I'll look through those cookbooks and see what wonderful creation I can come up with!! Getting My Corned Beef On!!! No, I didn't use Jonathan for the St. Patrick's day celebration ... he just wanted to say hello! So far he has survived the almost three month trip to Arizona. I say "so far" because you never know with birds. They can look just great one minute and be toes to nose the next. It's hard to believe he's 40 years old. At any rate, he said to tell you disco, kitty kitty, whatcha doing and pretty boy!! After an hour cleaning Jonathan's house, I remembered the corned beef I wanted to cook. Notice the liner? I remembered it TWICE in a row (mostly because I had to take the box OUT of the pot). I trimmed up the meat and tried to fit it in the cooker, but it was WAY too big. The solution was to cut it into smaller chunks before adding beef broth. Since I had no idea how long to cook it (there are no crockpot directions in the bag), I set it on low for 8 hours while I dug a hole in the backyard ..... just in case!! Later in the morning, when I entered my sewing room, I decided it was time for a little reorganization. The cabinet on the right which was totally crammed with fabric, needs to be moved to another wall. Not a cheap piece of furniture ... this things weighs a TON!!! The top section comes off, but I still need two big men and a boy to move it. Maybe I can call a moving company. Since I'm dropping ice cream from my menus, I'm replacing it with one cookie after dinner. I've got a terrible sweet tooth!! Now THESE are peanut butter cookies you can wrap your mouth around!! Can you believe it?? I didn't burn a SINGLE batch. At least it kept me busy for a couple of hours and all but one ended up in the freezer! Okay, maybe two!! Finally, it was time to pull the corned beef out of the crockpot. WOW did it shrink up or what!! I sliced it and took my first bite. Guess I can go fill in that hole I dug. Although the ends were a little dry, it was YUMMY!! I must have eaten three pieces before I even sat down to dinner. No cabbage or potatoes, but the brussel sprouts I cooked the day before went perfectly with it. I think this is the first corned beef I've ever cooked and I'm so proud it's edible!! I was too lazy yesterday to go anywhere, so my long list is still awaiting attention. I added potatoes to the grocery list, as corned beef hash is one of my favorites!! Never cooked that before either, but I can't wait to give it a try. I have almost four pounds of meat to eat up!! Yup .... I'm back in SUNNY California!! It looks pretty cold, but it's not. Lows have been in the 50's ever since I got home, but for whatever reason, there's been fog around 7:00 am every day. Much as I wanted to sleep in yesterday, that never happens. Being the old lady she is, Jessie gets up quite early and goes out the doggie door, which causes Cooper to jump up and down on my stomach. Kind of a boring day .... but I did get motivated enough to touch up all the scrapes on the walls in my house, but discovered all my little paint jars weren't any good. Lucky for me, most of them are named and numbered, so I'll hit up Kelly Moore Paint for some replacements. It was then that I made a MAJOR discovery! All of the doors in my house were very badly scratched by the previous owners dogs, with a few more marks from mine. I've tried lots of stuff, but nothing seemed to remove the scratches. Lo and behold, I found a can of the original stain/finish used on everything. After shaking it until my teeth rattled, I rubbed some on a bad spot and it disappeared. EUREKA!!! I couldn't believe my good luck!! Of course it's pretty old, so I really need a new can, but all those bad scratches are going to disappear!!! I'm so excited!!! By then it was time to head off to the LOVE Inc. dinner-auction. Close to 400 people showed up, not to mention all the volunteers. Dinner of caesar salad, rice pilaf, green beans, baked chicken and roast beef was served in record time, with six lines. First up was the dessert auction. Ann Kelly and I scouted out the best cake we could find ... this beautiful 3-tiered carrot cake!! The Bingo Guys stood at the table to make sure they overbid everyone else, and ..... VOILA ... dessert!! Not really worth the $100 we paid for it, but it was delicious and the money is going for a good cause. With all THAT going on, there was a silent auction happening all along the outside walls with over 200 items. Bid fast and bid high if you want something!! This 24" metal sculpture looks just like my Showby horse, so he garnered my attention. The other four items I bid on and was winning, thankfully went to someone else who wanted them more than I. The horse came to live at my house. If I can get my act together today, I'll head off for some paint, some material and some groceries ... oh and a new shower head to replace mine that is leaking more water out the connection than the shower head!! Installing THAT should be a fun trick!! Although I planned on cooking this beautiful piece of corned beef for dinner, it didn't happen. That may have been the luck of the Irish for me. I'd have to dig a pretty big hole for this one if it didn't turn out. As it DID turn out, a friend from Sacramento called to say she would stop for a visit around dinner time ... and she was buying! So I stuck the beef back in the fridge and commenced to make a little more headway on the stale smelling house. It dawned on me that I have been changing my air filters at every daylight savings time change ... a good way to remember to get it done ... and I was behind in that endeavor. It takes my tallest ladder and I have to stand on the next to the top step to get this one done. It was my exercise for the day, as each of three filters takes at least three trips, unless you want to drop them on the floor, then have to drag out the vacuum. All three were pretty dirty, so I turned on the air and let it run for thirty minutes, hoping to clean everything out. Between changing the filters and baking some pumpkin bread, the house smells considerably nicer. I know what happened ... I got in too much of a rush to leave and didn't cover every sink drain. I also found a leaky bathtub faucet in one bathroom, so I see a new faucet and a new challenge in my future. With that done, I sat on the couch with the puppies and watched a marathon of really, and I mean REALLY bad Leprechaun movies on the SyFy channel. I LOVE horrible B-grade SyFy movies, and these were some of the best, with some surprisingly well known actors in them. They must have really needed the money that day. As I put away my now clean laundry from two more loads of wash, I decided to thin out the closet a little. These will all go to a local charity, along with lots of bedding I no longer need. A couple more movies under my belt and I did some preliminary trip planning for a Golden Spike rally in Eastern Oregon where we will ride some stream trains. A few years ago, the Chance family and I rode the Stump Dodger logging train in Sumpter, with me getting to ride in the cab and operate the controls. I'm going to give Dan all my moves so he can sweet talk the Engineer into letting him do the same!! Dinner wasn't quite as good as corned beef ... Colonel Sanders cooked some chicken and threw together a decent cole slaw, along with a drink, biscuit and cookie for $5.00 which my friend delivered at 5:00. After a short visit, she took off for Sacramento. By 7:00 I was down at the Elks Lodge for an 8:00 meeting. I should have gone a little earlier. They had a corned beef and cabbage dinner that was amazing!! Gosh, I hope I can cook mine half as good. A couple of the Bingo guys gave me a taste before it was all gone. Next year you will find me THERE!! It was then that I discovered I'll have to wait yet ANOTHER day to cook my corned beef, as tonight is the annual charity auction for LOVE Inc, an organization that will help anyone in need. Not only that, but they give people the tools to live a better life ... like job training, how to handle money and a checkbook, how to help other people ... it's a great organization that has very good success in this area. Besides that, they get the BEST donations, which they auction off to raise money to continue their cause. Our Elks Bingo proceeds buy three tables and we all provide lots of money for bidding, including at least $300 for the dessert auction!! AND we get a wonderful dinner prepared by a catering service which donates everything for around 250 people. It will be a fun night. I just need to find my checkbook!! Get A Little Green On!! 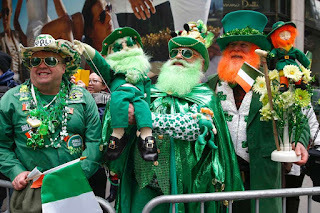 Happy St. Patrick's Day!! These guys are celebrating in style by getting THEIR green on. Interesting guy, Saint Patrick. Turns out he wasn't really Irish at all, he was from Great Britain, kidnapped as a child and forced to shepherd animals in Ireland. When he finally escaped and returned home, he became a cleric. Later, returning to Ireland, he eventually was named a Bishop. Turns out green wasn't even his favorite color .... St Patrick's BLUE was his choice, but the green fields of Ireland won out. He didn't really banish snakes from Ireland either because there weren't any in the first place. Nonetheless, it's a great day for a celebration of the Irish Green and your Irish heritage. Although I had planned to cook some corned beef and cabbage today, the cabbage didn't get into my shopping cart. That probably was some kind of Freudian oversight, since cooked cabbage isn't my favorite anyway. I used to love corned beef as a kid ... but have no idea how to cook it. I'm hoping I can crockpot it!! When I left in December last year, the Elks lodge wasn't sure if they needed a Trustee or not. Guessing NOT, I forgot all about it until arriving at the Magic Kingdom Tuesday, when the next thing after "hello" was "you're the new Trustee". The first meeting on the schedule is tonight, after THEIR corned beef and cabbage dinner. Looks like I'll still be celebrating this weekend when I get a chance to cook mine. Yesterday, having all of the ingredients in my kitchen for a reader-recommended dinner, I decided to cook Linda Sands chicken. LOOKIE HERE!!! I remembered the liner!! Actually, the last time I forgot, I put the box IN the pot where it will live from now on. Taking it OUT of the pot was easy peasy ... getting it INTO the bowl and not all over the countertop, didn't work out so well. In the end however, this chicken, diced tomato, black olive and mushroom dish was downright yummy over rice. Thank you Linda for a quick and easy dinner that I couldn't mess up! Next up, salsa from Mister Ed!! In between more cleaning, several more trips to the RV and pot watching, I sewed a few more squares. Obviously, there's one that won't be in the final version. Can you guess which one? I'll have to come up with some different fabric for THAT bottom left square. My gardeners are coming today so I have to get my act together. There's a huge pile of limbs in MY back yard, having fallen off the neighbor's tree. I suppose "I" have to pay to have it all removed. My yard looks GREAT however. They've been doing a good job and it's green as can be, due to all the rain. One BAD thing about this water though ... every time you step outside, all you can smell is MOLD. Hopefully the sun will come out today and dry things out a little before the next big rain. That's funny, I've never seen THIS version of the castle at Disneyland, but that's not where I went anyway!! 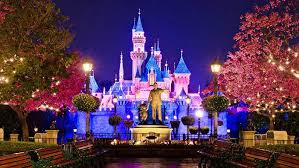 MY Magic Kingdom where the King rules, the Court Jestor makes us laugh and the Castle Lawyer keeps everyone in line, is located in beautiful downtown Merced California. The funny smell in my house in finally abated ... not totally, but it greatly improved. I spent the better part of the morning cleaning the bottom of my oven. It has a self-cleaning mode, but my labor is MUCH cheaper than an hour of electricity at 500 degrees!! I found something interesting in the bottom .... what looked like magnets. Then I found a piece of metal. Something went ding in the back of my head when I remembered the magnetic bar I was going to glue to a name tag. It disappeared some time ago. Apparently it got stuck to something I put in the oven ... most likely a cookie sheet. How weird is that? Unfortunately, it's no longer viable. It came out in four pieces. It was about then that I realized I really didn't have to wash all my dishes by hand as I used them (like in my RV) ... I could actually put them in the dishwasher. Funny how easily you forget those things when you're on the road. I began gearing up for the Magic Kingdom ride about 2:00. It takes a little time to mentally prepare for the 4:30 onslaught of mankind. I love it when I walk in and everyone says welcome back and gives you big hugs ... especially the Castle Lawyer who has been handling the infernal machine all by her lonesome the entire time. From all accounts, she did a fabulous job!! Surprise surprise!! Everything went VERY smoothly as I remembered to plug in the debit card machine and how to make payouts, a complicated set of button pushing to open the cash drawer. I was welcomed back by many of the regulars, although sadly, some have gone permanently missing, along with many newcomers crazy excited about winning MONEY!! When you've been gone for awhile, some of the old peasants try their best to scam you again, usually followed by the new "younger" peasants trying the same games. Nothing!! Not a single scam came to the table last night. That was a shock to my system! Everything went swimmingly without incident ....... almost!! There are some cranky peasants, then there are CRANKY peasants. She was SO cranky she was funny, as she cussed us out up one side and down the other because we couldn't understand her broken English. Funny how we definitely understood THOSE words!! As we paid out well over $5,000 and counted the nights proceeds, it was good to know it's all going to charity. Nineteen volunteers helped us out last night, I think that's a record. On the other hand, many players were down to their last dollar as they paid us for bingo cards with handfuls of change. It's always interesting to say the least. I've got appointments the rest of this week ... catching up on teeth, eyes, blood and all that good stuff. Since that's not all that interesting, I'll try to do something a little more exciting to write about!! Smoke .... LOTS of Smoke!!! I try not to get too excited about most things, but when your smoke alarms go off, it kind of sends you into a panic!! It was a normal Monday ... I brought in the trash cans, let the dogs out, fed the bird and tried to find something for breakfast. In scrounging around the kitchen, I found a big decorative pot full of little one-serving bags of oatmeal. Gee, I wonder when I put these in HERE?? I tried one, but it immediately went in the trash, along with all ten other bags. Next time I'll put a sticky note on the outside so I remember they are there!! Since chicken rice casserole was all I had left, so that became breakfast. I was looking forward to dinner, as I made some of Miss Terry's WONDERFUL pizza dough two days before! In the meantime, when I tripped over this bag of material, I figured it was a sign to begin this quilt!! Not quite as easy to cut out as I hoped, and a little difficult to figure out what color to put with what, but I LOVED the results. In the meantime, I began to prepare the pizza. I should have written down every single step when Nick and Miss Terry were here. I did remember the parchment paper, plopped the dough on top and tried to spread it out. That was a LOT more difficult than I remember, mostly because Miss Terry did that part. I dumped on the cheese, then scraped it all off when I remembered the sauce goes on first. Now piled high with sauce, provolone and grated mozzarella, I layered turkey pepperoni (less fat), olives, thin sliced onions and a little more cheese. I turned on the oven (my big one, convection/bake and all that fancy stuff) to a scorching 500 degrees. I used the parchment paper to lift the pizza into the oven on the now very hot pizza stone and closed the door. I can't wait!! I set the timer for six minutes and was off to the sewing room for another quick square. Isn't it pretty? About mid way, I heard the alarms go off!!! I RAN to the kitchen through billowing clouds of smoke!!! Some real special words came out of my mouth as I hit the exhaust fan switch. There's no turning those alarms off, they are up on a 14 foot high ceiling. The puppies were cowering in the corner. Not the smartest move, but I opened the oven door and even MORE smoke poured out. No fire however, so in spite of the screeching alarms, I was pretty happy. Here's the deal .... always ALWAYS leave at least an inch and a half around the outside crust with NO cheese or sauce. Cheese was dripping down on the bottom of the oven, then rising up in clouds of smoke. Once everything settled down, I used my pizza peel to take it out of the oven, whereupon I removed the parchment paper, pushed all the cheese back on the pizza and replaced it in the oven for another six minutes to finish cooking the crust to a perfect crispy brown. I'm pretty sure you know what happened ... everything I pushed up immediately ran back down and off the pizza stone releasing another round of glorious smoke, which luckily the exhaust fan was able to keep up with. I finally gave up and removed it from the oven a tad under done. What I wouldn't have given to have Miss Terry back in my kitchen!! The final result, removed from the pizza stone and placed back on the parchment paper, didn't look too bad. I cut it up and took a bite. All I can say is YUM YUM!!! This is such a great recipe, you've GOT to try it ... just keep everything AWAY from the edge of the crust!! I'm going to do a little more sewing today, before attempting to clean the oven. Later, I have to get ready for BINGO!! That's right, it's MAGIC KINGDOM time and I've missed all my friends there!!! The good news is that my house now smells of a combination of skillet fried steak -- burnt cheese -- and Fabreeze!! Back to normal!! Although it didn't happen for me, the time did change for Californian's, causing the stock in Starbucks to raise considerably. In the fall, it's not such a bad deal, giving us lots more light at the end of the day, but in the spring, it's the pits! Thankfully, I've just come from Arizona where they don't believe in this nonsense!! It continued to rain all day, filling all my flower beds to the brim. The lawn looks spectacular and things are growing beautifully, like in the old days. Its been many years since I've seen this much water, although it used to be a regular occurrence. You can definitely see why people would abandon an area completely in the ancient days because of a shortage in the water department. With a bad stomach, I stayed on the couch for a couple of hours. If there's a good movie on TV, I can usually sit for awhile. When the movie was over however, I cooked some rice for breakfast, unloaded more essentials, like Jonathan's food and Cooper's toys, then set about organizing the bags of material in my sewing room. When I came upon this one, I thought it was small enough to get a good start on. My plan was to cut it into the required pieces, then work on it throughout the week. It went wrong somewhere around ten minutes after I cut it out. I sat down just to sew a few together to see what the rows would look like. Before I knew it, I had spent all day at the sewing machine and it was finished. Truth be told, it's small ... 41 x 57 ... with large blocks, so it was a cinch to put together. Since I had THAT much done, I might as well stitch the backing together and take it to the quilter. I think that makes five now. Ann is going to just LOVE me!! After a nice bland dinner of chicken and rice, I ate one more small piece of cherry pie. Boy did I wish I could have a do-over. I'm more than willing to mail the remains to whoever has the nerve to try it, just be sure you have an entire bottle of tums available. Honestly, it wasn't the pie ... it was my stomach. It was a delicious Claim Jumper frozen cherry pie that I baked in my GOOD oven!! In the meantime, when not doubled over in pain, I got out Blu's new friend, Mr. Toby Nariz and hung him on the only blank wall in my house. He reminds me of our old mule Jack that we used to play hide and seek with when packing in the mountains. Jack didn't like to be led, so the rope was thrown over his neck and he followed .. mostly anyway. Occasionally he would fall behind on the trail. Knowing this was his M.O., we would hide in the trees and bushes. When he finally raised his head and discovered we were out of site, he would race down the trail braying loudly while looking for us. About the time he ran by, we would jump out behind him. You should have seen the look on his face!! He was such a good old mule!! Ahhhhh the old days of jumping horses, breaking arms, loading mules, breaking ribs ... I miss it terribly. Since cherry pie is out as a room freshener, I'll have to go online and see what else I can find to reduce the stale air smell. I'm sure that will require more cleaning and vacuuming ... ugh ... but it must be done. I think it's time to take one room at a time and do a total clean-out. Out with the old, in with the new and off to Goodwill!!! In between rain storms yesterday, I unpacked more boxes. When I picked THIS box up, I was rather concerned about the weight. Did they really put my Mata Ortiz pottery IN the box?? Yes they did!! This piece was made by a master of pottery. It has super thin walls, making it light as a feather. It stands about 18 inches tall and has a place of honor on my bookshelf. I even put a note inside of the origin and value so no one plants a cactus in it like my grandmother did hers. In between loads of goodies and loads of laundry, I stitched up another quilt. Just kidding .... I had the main part of this one completed already, so I pulled out the fabric for the borders and stitched it together. This one and three more will be off to the quilter in the next day or so. This one's for my quilter friends ... I'm sure they have heard this before!! My feelings exactly!! Although I did do a double take when I counted 20 bags of material on the floor of my quilt room. I know that's a LOT, but most when completed will be donated to the Elks or Veterans organizations for raffle prizes. The rest will be displayed on a Southwest style ladder that I haven't made yet. All the while I was unloading, vacuuming, cleaning and being a couch potato, I was thinking about those ugly steaks I put in the freezer. I decided to see if any of Patty and Dan's cooking skills had rubbed off on me, and barbecue one for dinner. Here's the Weber I picked up before leaving for Indio, but didn't have room for. I used to barbecue a lot in the old "marriage" days. These actually come in pieces and you have to assemble it, which I did!! I was pretty proud of this one! The only thing left was to add a bottle of gas and fire it up. Fire it UP!! FIRE IT UP!!! Nothing ... no gas, even though it's a brand new bottle, and no fire. How sad is that?? No problem, I just got out my trusty cast iron skillet and threw it on the "stove" gas fire. It worked like a charm. I did have second thoughts when I saw how much fat and marbling these have ... my stomach doesn't always like that so much. Thrown together with a big salad and garlic bread, I had a delicious dinner!! Half that is ... I only ate HALF! To combat the stinky house smell, someone said to bake a pie or cookies in the oven. Okay then, cherry pie it is!! Oh my goodness .... it was yummy!!! Yes it did help with the stale air a little ... maybe I'll have to bake two or three more! It was all a very BIG mistake!! About midnight, I woke up with the most terrible stomach ache EVER!! Several thoughts went through my head ... the first being food poisoning, the second being the flu and the third being too much FAT for dinner. No matter what I did, the queasiness wouldn't go away. I was finally able to get a Tums down my throat by nibbling on it for several minutes. I can only assume it was the FAT ... although now my stomach AND head hurt, but at least it's considerably better than last night. You will find me entrenched on the couch today with one of my warm quilts, as rain continues to fall. Should I Stay Or Should I GO!!! It's Pouring Rain In Arizona!! Why Did The Roadrunner Cross The Road? My Dream Home .... 1880's Style! Singing Wind ...... Don't Miss This One!